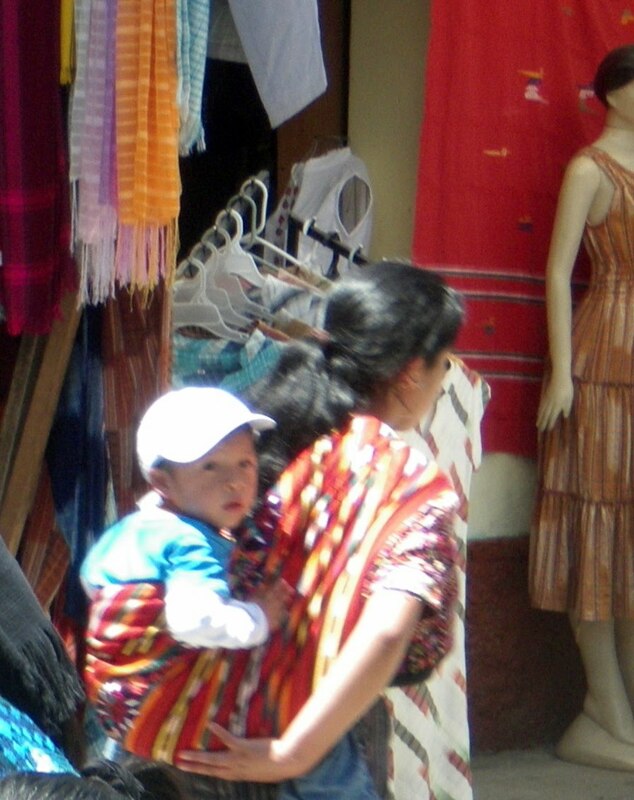 One of the cultural habits that is immediately evident in Guatemala is the act of baby-wearing. 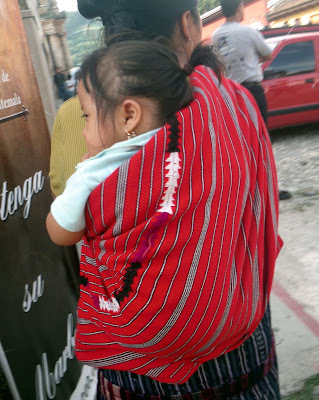 Woman carried their young babies and even toddlers wrapped firmly upon their backs with beautiful fabrics that we Americans notice as being icons of Guatemala. American's tend to tow their babies in strollers. I myself have 3 children and we went through 3 different strollers designed for 3 different activities. Though I had strollers I also went through a period of time when I wore my babies but let me tell you it wasn't as easy as these women made it look. First, it was difficult to wrap the baby in a way that I felt both comfortable and safe. I think safety is a concept that we have been taught to become scared of not having enough of these days especially when it comes to our young ones. I'm sure our overly commercial/disposable society has a lot to do with that don't you think? Ufff, this blog was never my intention to get overly wordy...so enough...just look and observe. This woman was spotted in a town called Chicicastenango on market day. I'm a shameful photographer so the shots aren't that great. 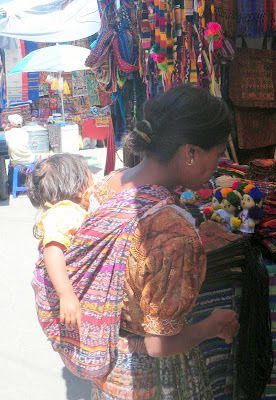 Here is another woman at the Chichicastenango Market. This woman came and sat next to me at on a bench at the park in the center of Antigua. 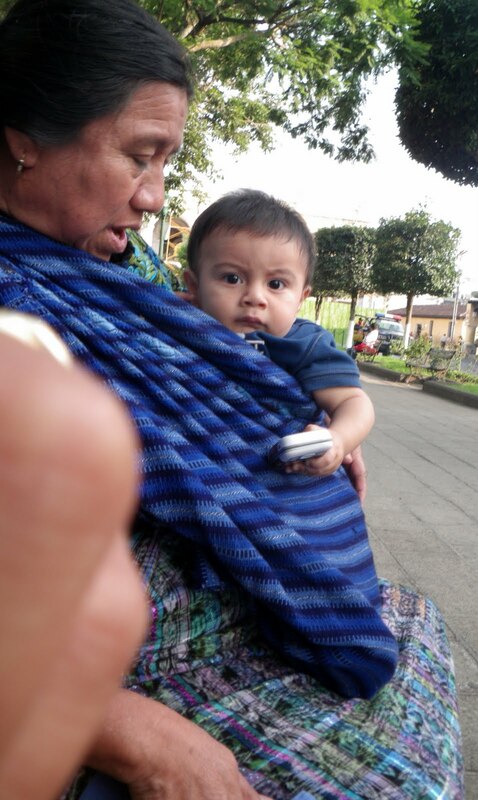 She is holding her grandson. We chatted for awhile and she told me how her daughter was a working woman and she now takes care of her grandson during the days when mom is at work. Notice how he is holding her cell phone. I love it!! 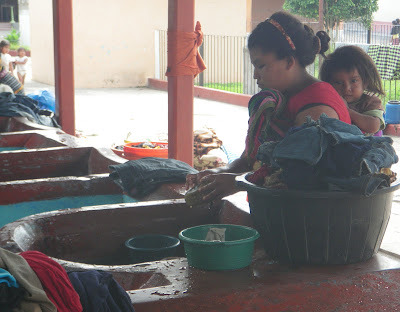 All but the picture below are photos of Mayan women. Almost all Mayan women still dress in their traditional clothing called a huipil. Mestizos which make up the minority wear western clothing. Here is a woman doing her laundry in the town square with her baby in tow!